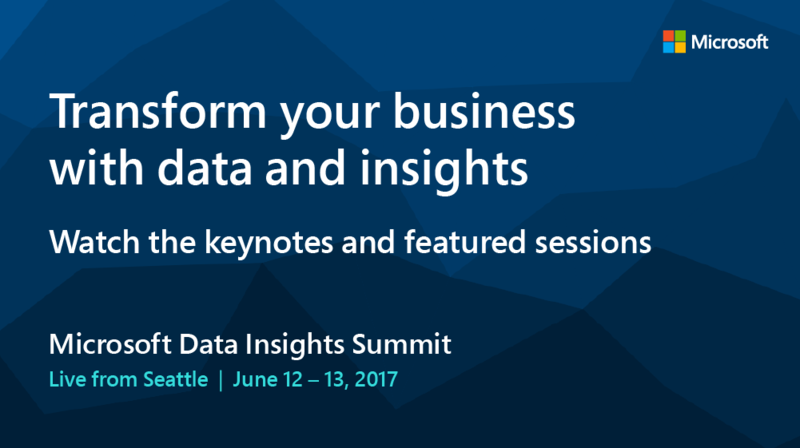 Can't make it to Microsoft Data Insights Summit? We’ll bring the conference to you! We’re livestreaming our three keynotes and nine of our most popular breakout sessions, June 12–13, 2017 so you can learn alongside attendees. As Microsoft’s conference for business analysts, the Microsoft Data Insights Summit is filled with strong technical content to help you build a data culture at your organization. See the full livestream schedule below. Mark your calendar and get ready to transform the way you work! Get the latest product updates and vision for BI from Phillips, CVP of the Business Intelligence Products Group. Take a tour of Power BI—and everything it has to offer—at this info-packed session, complete with plenty of demos. Perfect for new and experienced users alike. Led by Microsoft program managers Adam Wilson and Kim Manis. Extend your Power BI solution to everyone on your team with Power BI Premium! Learn how our latest offering can bring you dedicated capacity for your organization. Led by Microsoft program manager Adam Wilson. Get the basics of data science, specially designed for analysts! Learn how to apply the process of data science to Azure ML—and build a custom machine learning model and web service for your business. Led by Microsoft program manager Ted Way. This demo-rich session will show you how the dynamic duo of Excel and Power BI can boost your business analytics and insights. Led by Microsoft program managers Olaf Hubel and Alexander Lahuerta. Renowned for his award-winning work in the field of data visualization, author and professor Alberto Cairo will teach you how to unlock the stories hidden in your data. Get tips for turning simple data visuals into memorable data stories, and learn how to share those stories via SharePoint Online and other web channels—and more. Led by Microsoft program manager Jeff Lumpkin. Learn how to leverage Power BI Mobile applications to make data-driven decisions on the go. Led by Microsoft program manager Romi Koifman. Back for its second year, this session is packed with new hints and hacks to help you get the most out of your Power BI Desktop reports. Led by Microsoft program manager Will Thompson. Learn about the latest and greatest that Power BI Desktop has to offer—and get a sneak peek into what's next! Led by Microsoft program managers Kim Manis, Will Thompson, and Amanda Cofsky. Learn how to build your own business applications quickly and easily—no coding required!—with PowerApps and Microsoft Flow. Led by Microsoft product marketing manager Cathy Dew and Microsoft program manager Audrie Gordon. Learn how to think like a Freak with the minds behind Freakonomics. Bestselling authors Stephen Dubner and Steven Levitt will show you how to create a data culture at your organization — leading your team to make better decisions every day with data. Join us June 12 – 13 on the Microsoft Data Insights Summit website to watch the live broadcast. In addition to the livestreams, all session content will be available on-demand post event, so please check back for the latest updates.